The capital of the Costa de la Luz is a low-key, unpretentious city that shines for its wonderful seafood, Blue Flag beaches and historic centre that hides a cornucopia of fascinating little attractions. It’s all set up for a very indulgent holiday spent on a sun-lounger by day and with loved ones over a delicious, leisurely Spanish meal in the evenings. When the sun’s too hot you can retreat to the dark streets of the oldest neighbourhoods to see the sights, or wander beneath the swaying palm fronds at the city’s park. Part of the joy of this 18th-century fortress comes from the journey. The fortification is at the end of Paseo Fernando Quiñones, a long stone causeway that runs from the northwestern edge of the city. The views back to Cádiz from this elevated path are scrapbook-worthy, and you can pause to dangle your legs over the wall and watch the Atlantic. The fortress buildings are from 1706, but the lighthouse here has Muslim origins. As it’s so detached from the mainland, for much of its lifespan the Castle of San Sebastián was used as a prison or for quarantines. Nowadays exhibitions and concerts are held here, and scenes from the Bond film, Die Another Day were shot at the castle. 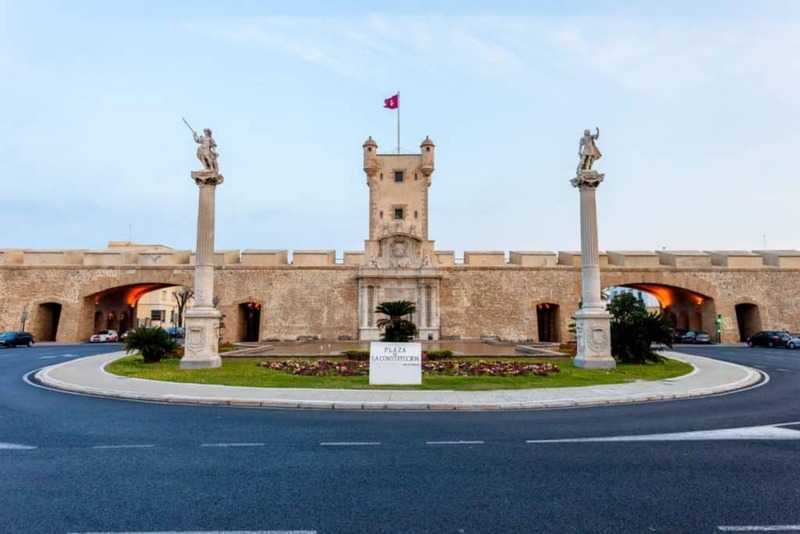 For Cádiz residents this bay on the west side of the city’s oceanfront is more than just a beach: It’s a postcard setting with huge historical importance as Phoenicians, Carthaginians and Romans all moored their ship in this natural harbour in ancient times. Today there are plenty of motorboats and dinghies on the north side, but no tall masts, and the Blue Flag beach is a place for people to relax, meet friends and enjoy the sun. Something curious about the beach is the way every single large rock has its own name (usually after an animal or everyday object), and many of these were bestowed on them centuries ago. Running up almost the entire western side of Cádiz is the 2.8 kilometre-long Playa de la Victoria, often rated as Europe’s best urban beach and up with the best of any kind in Spain. It’s just as popular as La Caleta but its size means that you’ll have little trouble escaping the crowds. If you’re up for some sport in the sun then you’ve got several volleyball courts and outdoor gym, while kids can run wild at the playgrounds. Hugging the length of Playa de la Victoria is the city’s Paseo Marítimo, traced by a promenade and with a choice bars, chiringuitos (beachside restaurants) and shops to round off a perfect lazy day. 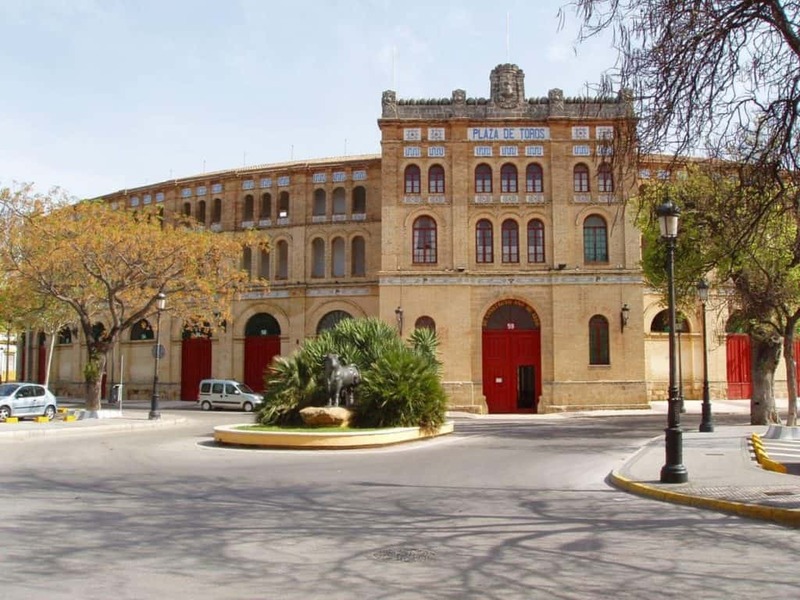 This fine 19th-century concert hall is in the neo-mudéjar style, reviving medieval Moorish design, and is one of the city’s top landmarks. You’ll enter via the large horseshoe-shaped portals that have the classic Moorish-style alternating voussoirs (red and white archway stones). There’s an exciting schedule at any time of year, but if you really want to get to know Cádiz’s bawdy folk culture, a visit during the carnival in February or March is a must. This is when there’s a competition for the Comparsas, musical ensembles that dress up in outrageous matching outfits and sing satirical songs about anything from popular culture to politics. 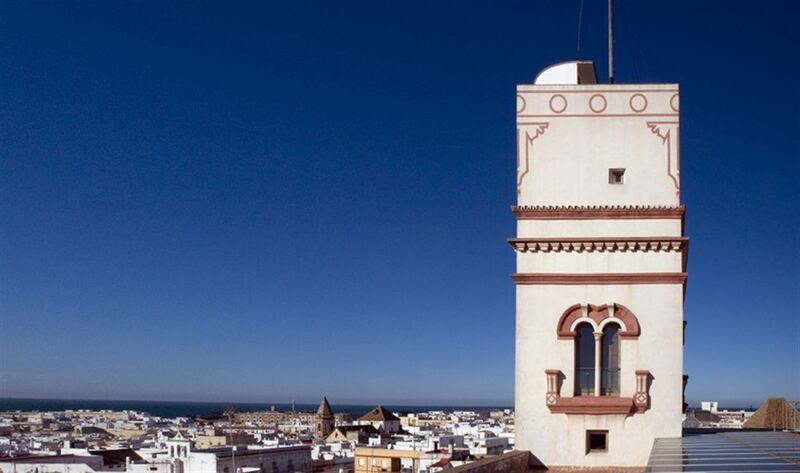 Climbing 45 metres above sea level, Torre Tavira was designated Cádiz’s official watchtower in 1778 when it was constructed. At the top of ten flights of stairs and 170 steps is a rooftop terrace with the best view in the city, west to the Castle of San Sebastián and south to the shining dome of the cathedral. One level below the terrace is the tower’s Camera Obscura, installed in 1994. Every half-hour you’ll be able to watch a multilingual demonstration of this instrument, which projects a real-time image onto a screen. The camera’s lenses have high magnification, so it’s almost like looking at the city through a powerful telescope. For another superb panorama of Cádiz you can also scale the cathedral’s Poniente Tower, from which you can look out over the port. The cathedral is from the 1700s and combines baroque, rococo and neo-classical styles. In this period Cádiz was going through a boom thanks to trade with the West Indies, Central and South America, which explains the building’s nickname of “Cathedral of the Americas”. In the crypt you can view the tombs of two of Cádiz’s most famous sons: The seminal early-20th-century composer Manuel de Falla, for whom the concert hall was named, and José María Pemán, a writer most active during Franco’s rule. Bordering the university campus to the north is a gorgeous waterfront park with paths made from the same sand used in Andalusia’s bullfighting arenas. There’s been a green space here for hundreds of years, but the park as we know it was the work of the eponymous Valencian architect Gerónimo Genovés i Puig. There are loads of diverting little details, like the grotto, which has a waterfall and ornamental lake stalked by sculptures of dinosaurs. The whole park is a big botanical garden, with tree and plant specimens from all over: Maple trees, poplars, Indian laurels, Canarian pine and Cycads from southern India, to name but a few. In most Spanish cities a trip to the permanent central market is a good way to see locals going about their day, and the best place to buy fresh produce. In Cádiz the market is an absolute must. The main explanation is that the city’s location on the Atlantic gives it Spain’s freshest fish and seafood. Get there in the morning and the tantalising piles of crabs, oysters, lobsters, shrimps, langoustines, tuna, eels, cuttlefish and much more is a sight you’ll remember for a long time. There’s also a gastronomic corner where you can buy freshly-cooked shrimp and oysters, as well as the usual bars that serve tapas with a crisp glass of beer. The Phoenicians from what is modern-day Lebanon settled much of coastal Spain a long time before the Romans arrived, but it can be very hard to find much evidence of their towns and trading posts. That’s what makes Gadir so valuable, because nine metres beneath the surface of Cádiz are the vestiges of a settlement from the 9th century BC. A great deal of what historians know about Phoenician life in Spain has been informed by this site, beneath the Puppet Theatre in the old town. You can inspect everyday tools and see a section of the city, including two streets and eight homes. Historically this part of Cádiz tapered into a narrow isthmus and marked the southern boundary of the old city. In the 16th century this bulky stronghold was constructed to bolster the defences and was reinforced in the 1700s. The tower that you see above the gate today actually has no defensive purpose. It’s a semaphore tower that was built in 1850. Using an optical telegraph system it was possible to relay as message from Cádiz to Madrid in two hours. Until the 20th century there were deep trenches running outside of the wall and just the one opening, before the moat was filled in and two more large arches were knocked through for road traffic. Strictly a separate town, you can reach this historic harbour by ferry or with a 15-minute drive. The old-town bears all the hallmarks of an Andalusian city, with pavements shaded by orange trees and buildings decorated with hand-painted tiles and wrought-iron balconies. The town’s first big claim to fame is that this port was where Christopher Columbus set sail for the Americas when he made his second voyage. The other is the town’s membership in the “Sherry Triangle”, so you can tour bodegas to sample this Andalusian speciality, stepping down to the cellars where the drink is aged in oak casks. 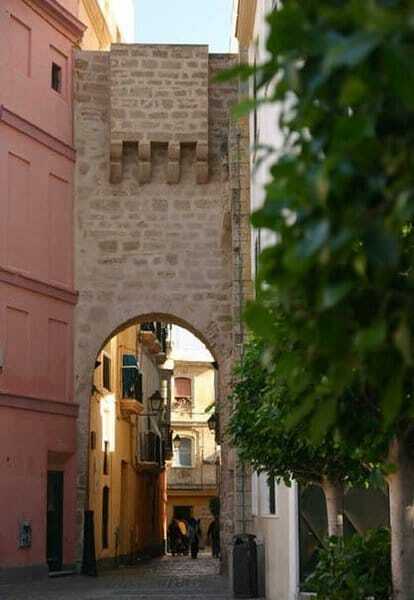 The oldest neighbourhood in Cádiz is at the lower end of the old-town. The name comes from a painting of the Virgin that adorned one of the gates in the 1500s: In Latin it read “Oro pro populo”, which means “pray for the people”. A walk here is a journey through gorge-like streets with local shops and bars, where very little sunlight makes it to ground-level during the day. Every now and again you’ll emerge at a cobblestone square blinking in the sunlight. As well as Cádiz’s cathedral you can discover the ruins of the city’s Roman theatre, only rediscovered in 1980. This attraction gives you a crash course in the city’s history, art and folk traditions, each category set on a different floor of the museum. The ground floor is a delight if you’re into ancient archaeology as there are sarcophagi with people portrayed in the sculptures on their lids, while all the best finds from the Roman port have found a permanent home here. The first floor has a surprising collection of renaissance and baroque art by Peter Paul Rubens, Francisco de Zurbarán and Murillo. The uppermost floor showcases the local Tía Norica puppetry tradition that reached its zenith in the early-20th century when Falla wrote music to accompany shows, and Picasso even painted the scenery. A straightforward road trip down the coast will take you to this small village loved for its sequence of fabulous sandy beaches. You’ll understand why you made the journey when you get there: Behind most of these fine sandy beaches is nothing but dunes and aromatic pines that cloak the hillsides and poke through the cracks in the cliff-faces. An historical note, the Battle of Trafalgar took place off this coast in 1805. The victorious British Vice-Admiral Nelson perished in battle and was sent home in a cask of brandy to preserve him. With the Atlantic on its doorstep it’s a given that Cádiz will have unbelievable fish and seafood restaurants. 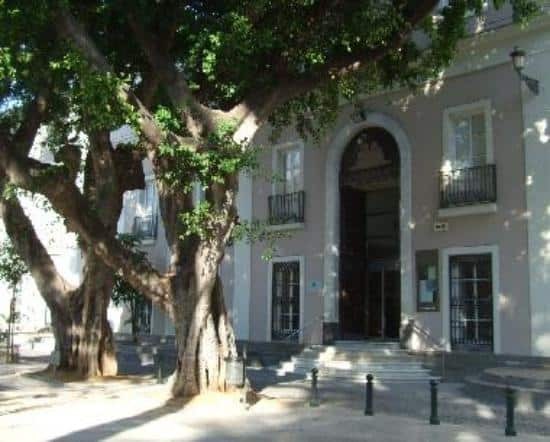 Many of the best ones are around Plaza de Juan de Dios a few steps from the port. A mainstay for decades is El Faro and you’ve got to try the Cádiz-style platter of deep-fried fish, served with a dash of lemon and local white wine. Fish stews are also sublime, and many follow recipes that developed on board trawlers down the years. Tapas is also part of the Cádiz lifestyle. Order a drink like beer or sherry (fino) and get a tapa to go with it included in the price of the drink.